The output voltages of switching regulators are basically regulated, which means that the regulators are provided with a function that maintains a set voltage at a fixed level. For the regulation, the switching regulator feeds back the output to a control circuit. Broadly speaking, there are three control systems: voltage mode control, current mode control, and hysteresis control. Voltage mode control represents the most basic method, in which only the output voltage is returned through a feedback loop. 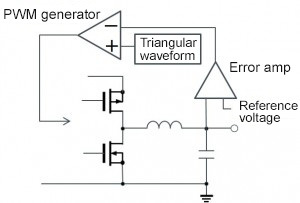 An error amplifier compares the differential voltage, obtained by a comparison with a reference voltage, with triangular waves. As a result, the pulse width of the PWM signal is determined to control the output voltage. Advantages of this method are its relative simplicity based on the use of a feedback loop consisting solely of voltages, the ability to reduce the on-time, and low noise and high EMI tolerance. Possible drawbacks are the complexity of the phase compensation circuit; an external phase compensation circuit may result in a cumbersome design process. The current mode is a modification of voltage mode control, where the inductor current in the circuit is detected and used instead of the triangular waveforms used in the control loop for the voltage mode. 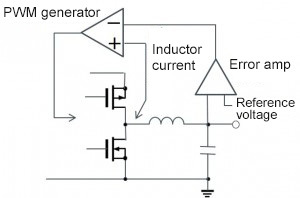 Currents can also be detected by using a drain-source on-resistance of the output MOSFET or current sense resistor instead of an inductor current. There are two types of feedback loops: voltage loop and current loop. Although the control exerted is relatively complex, they provide the advantage of a substantially simplified phase compensation circuit design. Other benefits include the highly stable feedback loop and a faster load transient response than that of the voltage mode. A drawback is that due to the high sensitivity of current detection, higher noise affects PWM control. The hysteresis control method was developed to meet the power requirements of even faster load transient response of load elements, such as the CPU and FPGA. Because it performs controls by detecting ripples in the output, this method is also referred to as a ripple control method. 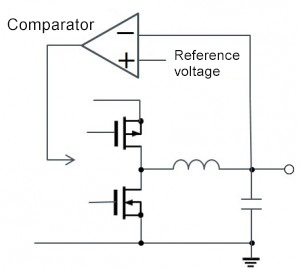 In this method, the output voltage is monitored by means of a comparator without going through an error amplifier, where comparator detects any voltage exceeding or falling below a set threshold value and performing switching on/off controls. Such controls are of three types: detecting a threshold shortfall with a fixed on-time, detecting a threshold exceedance with a fixed off-time, and using windows for both higher-than-the threshold and lower-than-the-threshold events. This method offers the advantages of extremely fast transient responses due to the direct control exerted by a comparator and the elimination of the need for phase compensation. The method suffers from the problems of switching frequency variation, large jitter, and the need for an output capacitor with a relatively large equivalent serial resistor (ESR) for output ripple detection. However, innovations in these areas have advanced, and increasing ICs are incorporating this method. ・The stabilization of a switching regulator is performed by means of feedback control. ・There are three major types of feedback control. For fast transient responses, hysteresis control has been gaining in popularity.